The transition area is a staging area for all your race stuff. There are two transitions in a Triathlon. The first is from swim to bike and it is called T1. The second is from bike to run and is called T2. 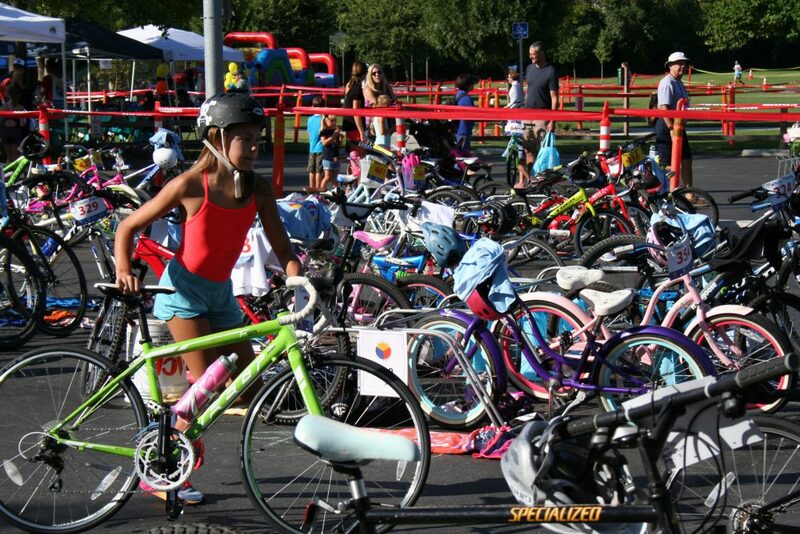 Both T1 and T2 will be at the same location for the Arden Park Youth Triathlon. It is important to practice both so that on race day you feel relaxed and prepared. Make a list of the items you will need for each event (see list below for suggestions). Once you have the items from the list, place your items on a towel. Not a big beach towel but a folded towel that is about the size of your desk at school. Remember there will be people next to you on race day so space is limited. Place your shoes and socks so they are ready to slip on your feet. Don’t worry about having to towel off after your swim. You will dry off really fast on your bike (if it is a really cold morning then you should dry off before you put on your dry shirt). Place your helmet in a place so you will remember to put it on your head. Practice putting your shoes, socks and helmet on as fast as you can! There is NO biking allowed in the transition area. You need to walk or run your bike to the transition bike mount area. On race day you can ask where you can start riding your bike. Let’s take a step back and figure out what to wear during your race. The most important thing is that you feel comfortable in what you wear. Keep in mind that you will be swimming, biking AND running. You will need to wear your race number on the run. So if you are planning on only wearing a swim suit you will need to plan to wear your race number on a belt. Race belts are simply an elastic band with your race number pinned to it. Of course if you are wearing a shirt you can pin your number to your shirt. Race morning pay special attention to where your rack is. The blue bike with sparkles might be gone when you get done with the swim. And it is easy to get confused when running from the pool to the bike. You can count which number bike rack your bike is on to help you find your bike. Look around and find out where you will be coming into the transition area from the swim. Find out where you will exit the the transition area to go out for the bike ride. Where will you be returning to the transition area from the bike? Find were you will be starting the run. Remember no biking in the transition area. And if you are riding your bike your helmet must be on your head and buckled. Place your shoes, socks, clothes and any other items on your towel like you have practiced. Take another minute to look around to make sure you know where everything is. Ask the volunteers if you are unsure of where anything is.